VG DANDY MAKES VG £6,366.00! Our May auction catalogue sold out completely with the star lot Dandy No 1 making £6,366 including 10% premium, just below its lower estimate. 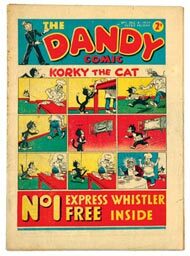 The rarer numbers 2 and 3 scored winning bids of £814 and £696 respectively, both substantially above estimate as were the early Beano issues culminating in a big £310 for number 74, the 1939 Xmas issue. Some early bound volumes were strongly bid with one of the pioneering cross-over film magazines, Picture Show, doing particularly well. Issues 1-26 were wonderfully preserved in a contemporary bound volume with bright page quality which belied the 1919 year of publication. Consequently Charlie Chaplin, Mary Pickford and Douglas Fairbanks were comfortably lifted to a £363 winning bid. Bound early issues of Film Fun from 1920 and 1921 also performed to packed houses. Please note our Prices Realised section for a full price check. 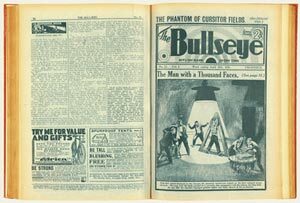 Bullseye, the detective thriller title from 1931 has always been difficult to find and fine copies of issues 1-23, once more bound into a volume, squarely hit the target with a winning £385 bid, nearly £17 each. In the fortnight before The Beano was launched, D C Thompson produced a full page promotional flyer for issues one and two which was inserted into their "Big Five" titles; Adventure, Hotspur, Rover, Skipper and Wizard. 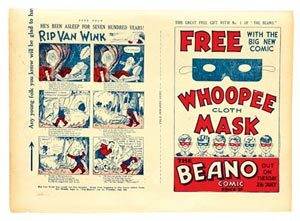 Printed in two colours, it folded down into a four page mini-comic in its own right with each Beano character profiled and full page stories of Morgyn The Mighty, Rip Van Wink and Contrary Mary. We offered a Very Fine example with an estimate of £120-150, having only seen a few copies over the last fourteen years change hands for around the £100 mark. To the astonishment of all concerned this pristine flyer soared to a stratospheric £462; a winning bid that was reduced from an even higher original bid* by an extremely determined customer. *For many years our policy has been that any bidder who places a very high or "knockout" bid on a lot will have that bid reduced to 10% above the next highest bid after the auction's close. e.g. A bidder places a bid of £600 on a lot and after the auction closes the nearest bid is £420, he or she gets a reduced winning bid of £462, (420 + 10%). Original material surrounding first and early issues is always keenly contested and when you travel North Of The Border there are a great many folk who want to display a wee something to remind them of those innocent days way back when. The first Broons Book from 1940 has a cover with portraits of Scotland's Happy Family all in their Sunday best and three original water colour artworks by Dudley Watkins of Paw, Horace and Joe Broon, on which the cover was based, were chased to £412, £275 and £330 respectively. These are the only individual portrait illustrations we know of and in the fullness of time these rare colour sketches may well turn out to be very canny purchases. In the same way The Broons Book No 1 was also bid to £3,575, only the second copy to come up for auction but in very nice condition indeed. 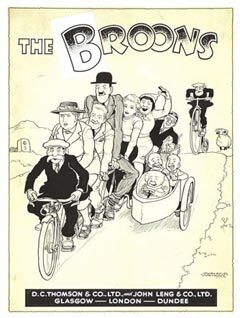 A 1951 Broons Book artwork frontispiece of the family cycling on an elongated tandem with the twins in a sidecar and Paw's Paw labouring behind on a penny-farthing was a wonderful signed original image that was finally knocked down for free-wheelin' £968. 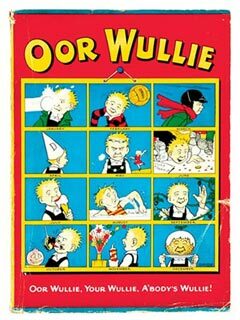 Oor Wullie artwork was also available and the Wee Lad's calendar themed cover page from 1949, once more penned by the master, was hotly contested to £1,140. His No 3 book, from which it came, raised £810 and the No 2 from 1943 (no intervening issues for five years due to war shortages) was carried off for £1,650. With less and less Frank Hampson artwork coming on to the market, we featured a Dan Dare piece comprising the top three panels of a board from Eagle volume 1 No 49 of 1950. From a conservative estimate of £200-250, it rocketed to an interplanetary £528. With a fine copy of Eagle comic No 2 making a record £72, col. Dan's appeal seems stronger than ever. Our selection of 1960s bound volumes generated some intense competition as the first 45 issues of Hurricane stormed to £495, the following 50 raised £248 and JAG 1-38 leapt to £380. A complete run of Valiant comprising 225 issues in 8 bound volumes was offered over five lots and one extremely keen bidder snaffled the lot for £1,081. He turned up in a minicab three days later to collect the precious goods himself. We didn't ask how he was going to smuggle them into the house as, disappearing into rush-hour traffic, his last words were, "Don't tell the wife..!" Our U S section contained a good supply of key Marvels with Silver Age first issues leading the field as usual. A Very Good copy of Fantastic Four # 1 flamed to £561, an Incredible Hulk # 1 in the same grade monstered £601 and Silver Surfer # 1 [vfn] rode a £194 wave. Pence copies all. Sometimes things don't always go your way. We received a phone call recently from a customer who wanted us to auction his complete Silver Age Marvel and DC collection, amassed by him since boyhood. He told us he'd been tracking our website for years and that the time had come to sell the archive and take the family to Disney World on the proceeds. He lived in Essex near the very last station on the Central line. Since driving through London is a nightmare these days I decided to take the long journey by train and carry a big wheelie suitcase to transport his 500 boyhood friends. 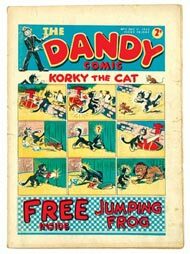 At the house it took over an hour just to put the comics in order as he said he'd never bothered to do this over a forty-odd year period as, "reaching into the cupboard and pulling out the first issue that came to hand was always much more fun." Several strong cups of tea later plans had been laid, key issues graded, prices agreed and the collection neatly packed into the suitcase. The house was only a few hundred yards from the station and just as I reached the entrance I heard a screech of brakes behind me as his distraught wife catapulted out of her hot-wheeled Micra. Roger was back at home literally crying over the loss of his Marvel heroes - he'd completely changed his mind and would it be OK if he didn't sell them after all? We returned to the house, unpacked the wheelie and put the comics back (alphabetically) into the cupboard. Roger cheered up and was really sorry for all the trouble; even the dog looked apologetic. I rode the tube train home. It seemed to take much longer. Sometimes things don't always go your way.